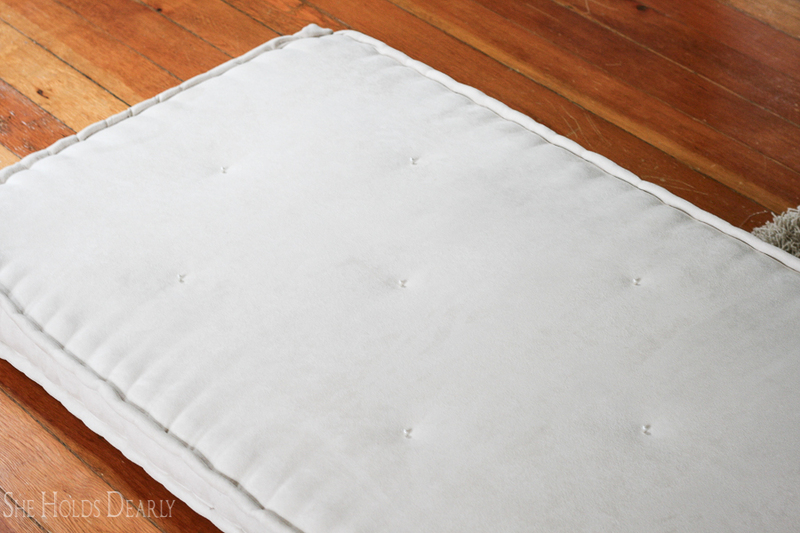 Are you familiar with french mattress cushions? 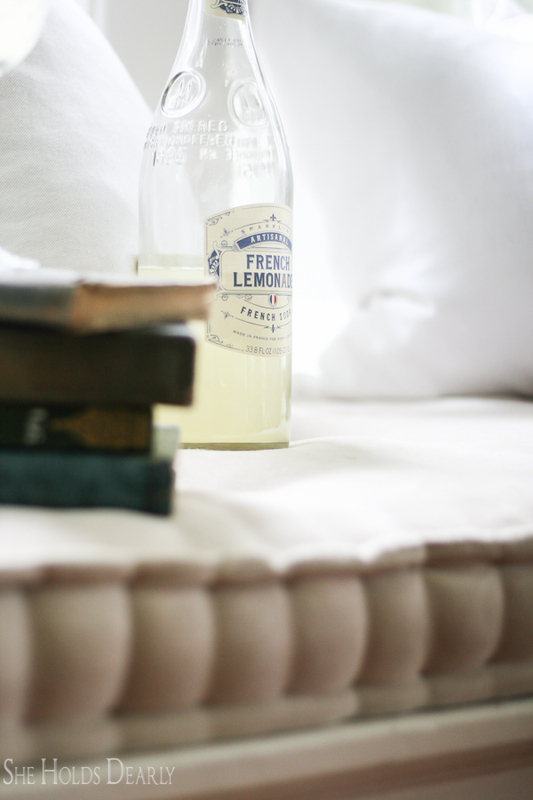 Originally, the French made their everyday mattresses this way! 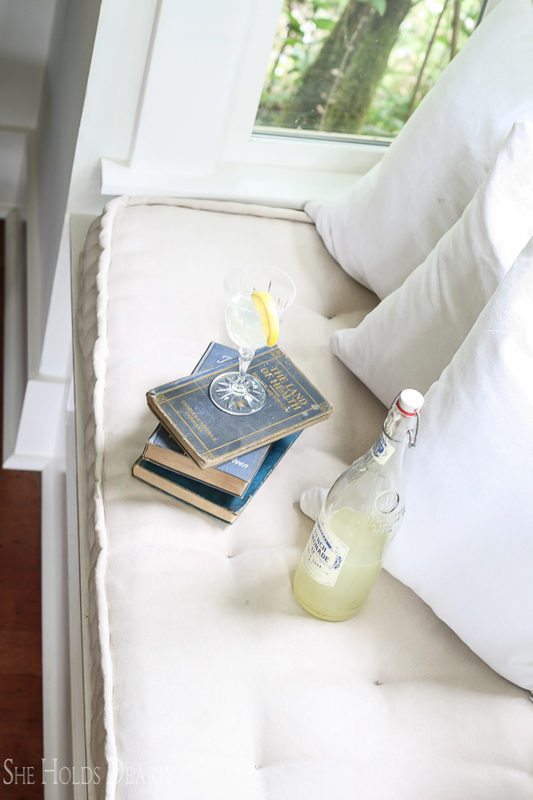 Leave it to the French to elevate the everyday items with beautiful detailing. 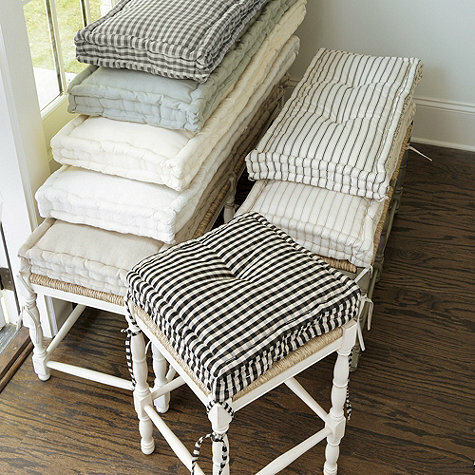 Marked by an extra big, bunchy edge welt and delicate, button-less tufts, these casual cushions add another layer of farmhouse elegance wherever you see them. 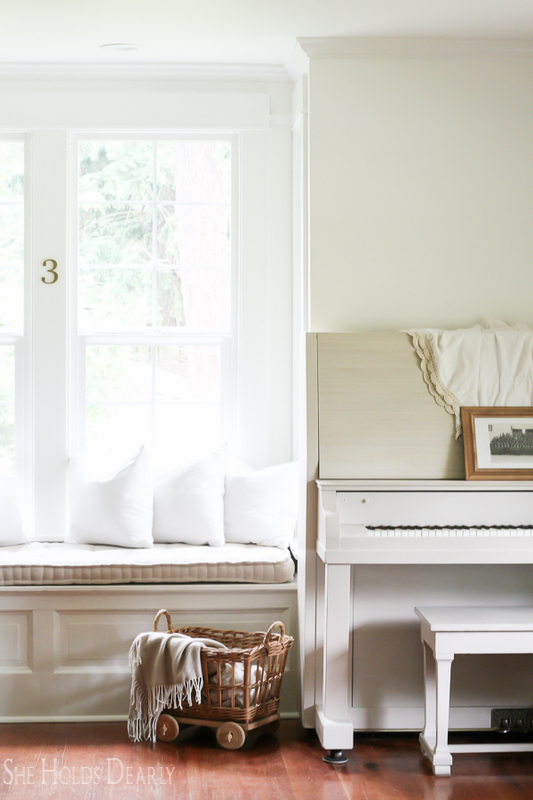 I have seen them online in few places and they always strike me as so timeless and cozy. But, I wanted to see if I couldn’t make one myself. There really isn’t much online about how to do it, so it was fun to figure it out. The welting and tufting stitches, in particular, are ones that I figured out through a lot of trial and error. I am happy to pass them on to you! I like to buy mine off Ebay. 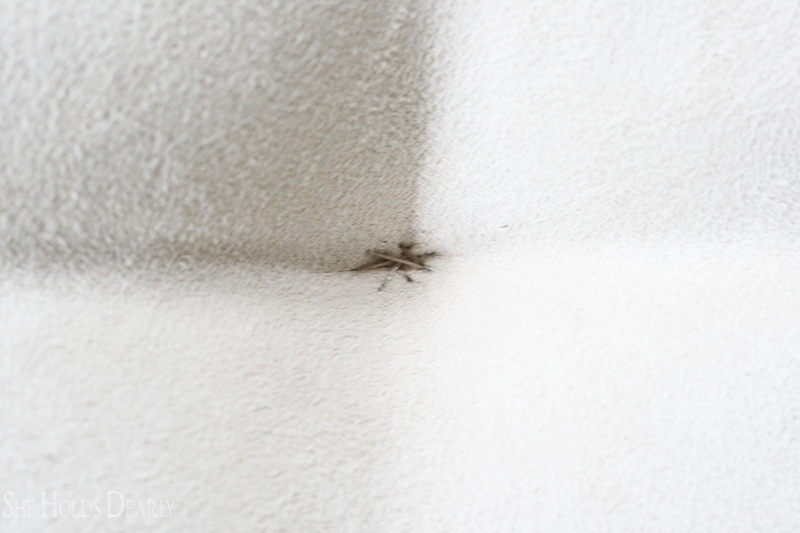 The foam pictured in this post is 3″ thick, which created more or a 2″ inch side on the cushion. If I were to do it again I would probably use 6″ foam. Cut with a serrated knife, using a sawing motion. An electric knife works great! I like polyester, 10 ounce which is 1″ thick. The fluffier the better for this project. I found mine at Joanns. Do not use piping, it is not malleable enough. Ticking and velvets are very french looking. 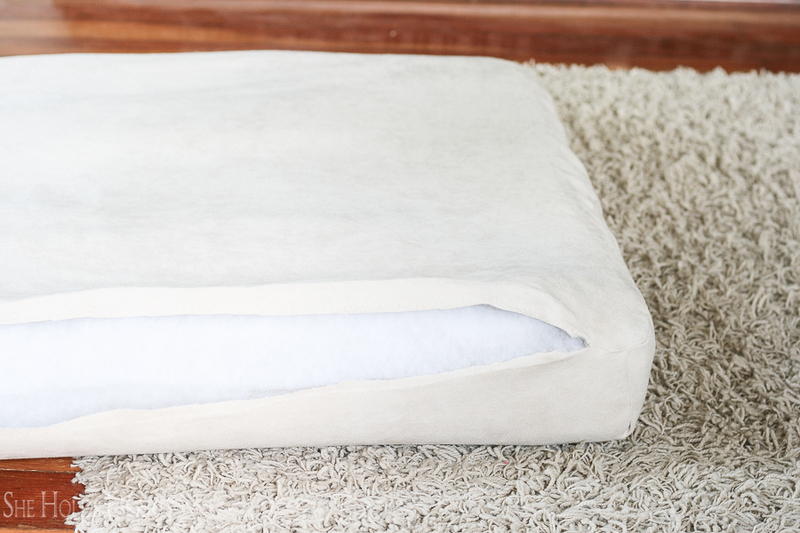 I used microsuede because I have a dog that thinks I just made her a new bed. 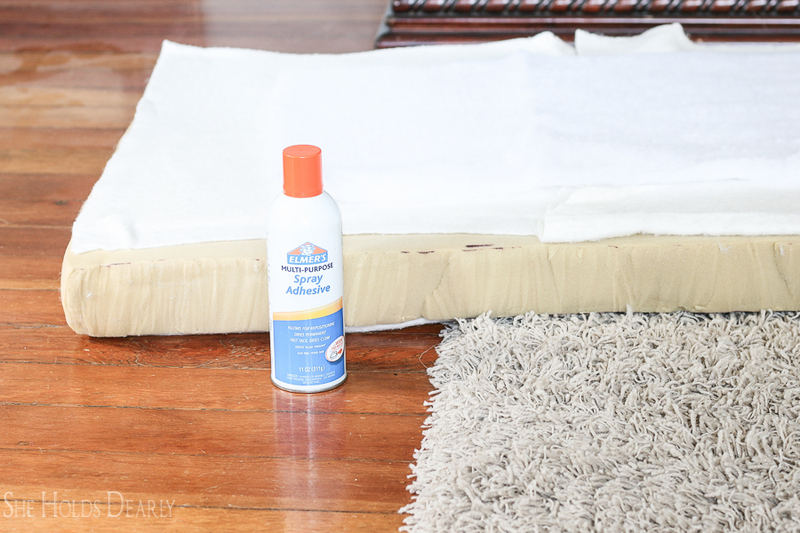 Microsuede is easy to clean with just a baby wipe. Buy thread that matches your fabric. I was lazy and just used what I had on hand. My knots are showing more than necessary now. Basically, if you don’t wear leather gloves you aren’t going to get through this project. On a cushion this size, I had to hand stitch for six hours. There is so much pulling and pinching and pushing needles through that my hands were aching and red with the leather gloves. Make sure they are skin tight on your hands. I use these Mizuno golf gloves in a Youth Small when I do upholstery. First, cut the upholstery foam to the desired size. Make the box cushion cover. When you cut out the fabric pieces be extra generous. Don’t just cut the extra 1″ seam allowance, cut and extra inch of both sides (3″ total) so you have lots to bunch up. I wish I had done this more on mine. If you have never made a box cushion, follow this Youtube video, skipping the zipper information. Leave one of the long sides open. Then, cut large panels of batting that will cover the top and bottom of the cushion. Cut two extra wide strips of batting to adhere to the top and bottom edges of the sides. These will be easy to bunch up when it’s time to do the welting. Use Spray Adhesive to adhere all the pieces to the foam. I used a big piece of cardboard and moved it around to protect the floor as I sprayed. 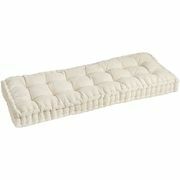 Carefully slide the foam and batting into the box cushion cover. Check all over and make sure the batting stayed in place. Pin open side shut, tucking in a little seam allowance on both sides as you go. 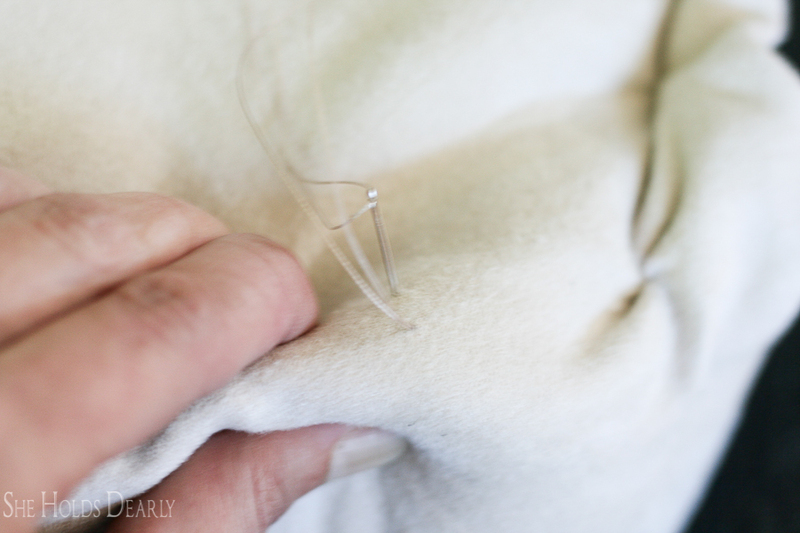 Use the 2″ needle and matching thread to slipstitch the opening closed. Here is a Youtube video showing how to do a slipstitch. 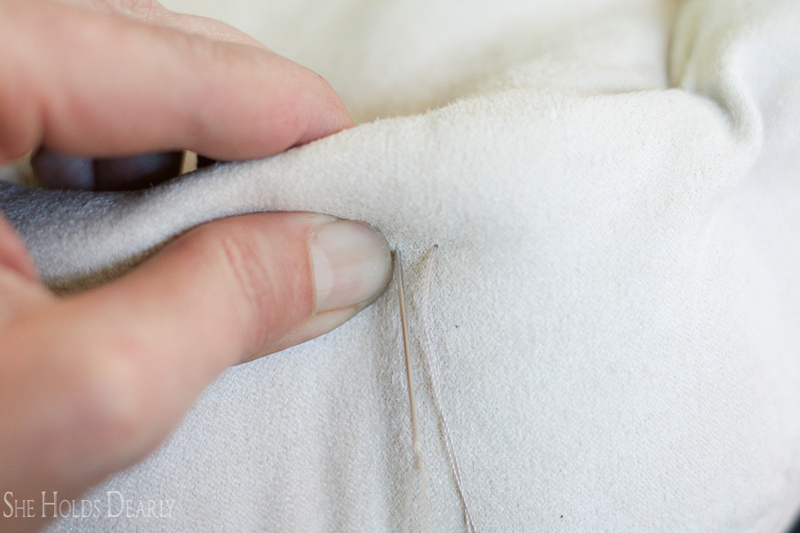 Using upholstery thread, gloves and the 2″ needle, start at one corner of the cushion. The stitch I came up with that gives the most bunchiness is a four step process. 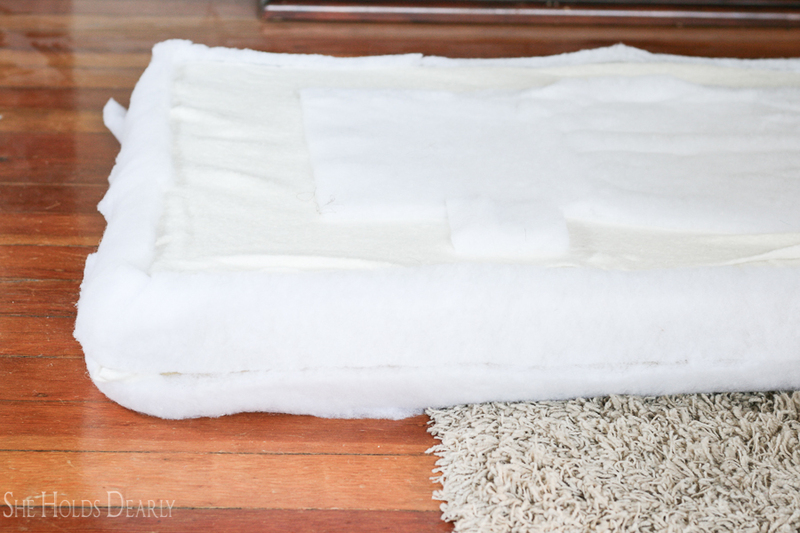 Start by pinching a good inch of fabric and batting, even a little foam if you can. Keep nice and high on the top edge. Next, make a 1/4″ vertical stitch on the top of the welting and come down below. Then, make a 1/4″ horizontal stitch underneath. Come out next to the bottom of the vertical top stitch. Finally, stitch right under the surface of the top fabric and make one large 1 1/2″ stitch inside the fabric to get to the place to start the next stitch. Pull tight as you go. Do this all along the top edge and then the bottom edge. 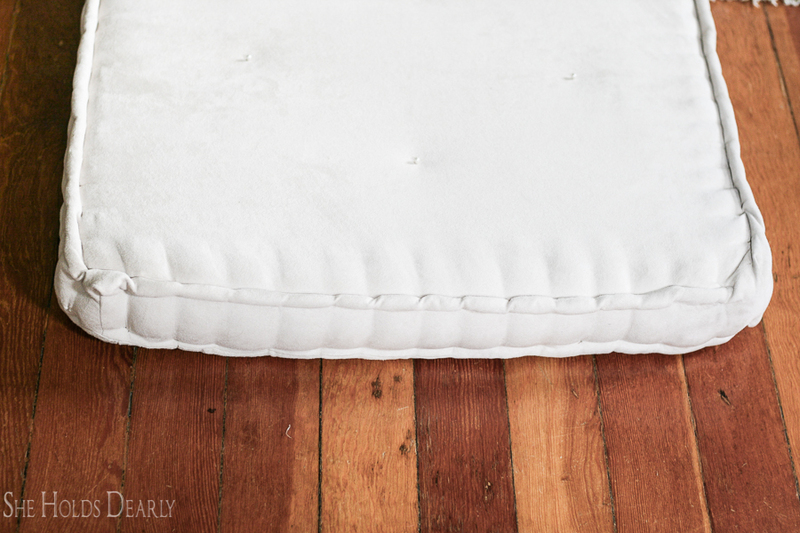 Once you finish the welting, you can decide on the tufting pattern. People seem to either do two parallel lines of tufting or a diamond pattern. Because I knew I would be covering the back half of the cushion with pillows, I decided to go with the diamond pattern. Measure out a plan and stick straight pins in on both sides to mark the tufts. 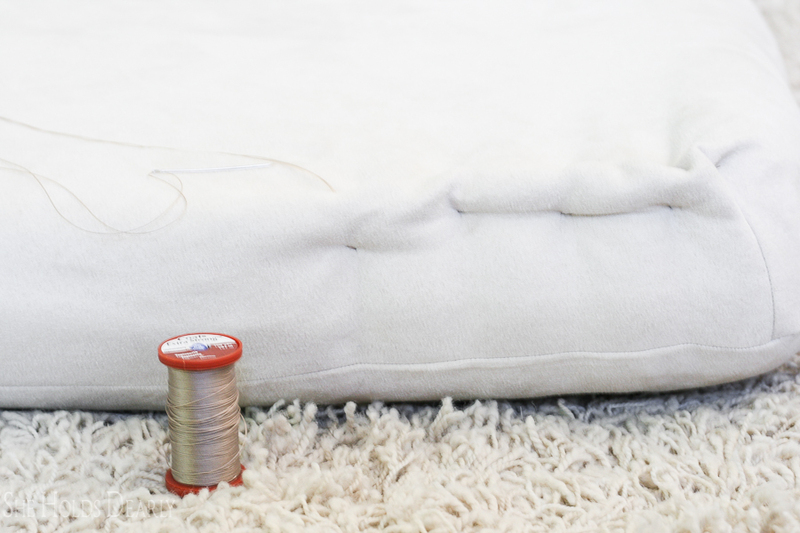 Cut a 4′ piece of upholstery thread for each tuft. Use double thread and an upholstery needle. Knot the thread. You will need to wear your gloves, but keep taking them on and off every time you make a knot. Stitch an * (asterisk star) shape about 1/2″ diameter. Note- the first knot goes straight through the fabric and gets lodged in the foam. Sew three complete stitches before you pull tight to create the tuft. The fabric has a ton of tension were each of the tufts are located. It is possible to tear a hole right through the fabric if the pressure isn’t spread out before pulling. Turn the mattress on its side while you tuft to make sure you coming out exactly were you want your stitch to be on the other side. Once you are ready to tie a knot, pull tight one more time. Take your gloves off and cut the thread, leaving the two tails as long as possible. Now, tie the two tails like you were going to tie a bow. Folding under and pulling tight, do this six times. Re-thread the upholstery needle and stitch the thread straight down through the foam and out the other side. It doesn’t matter where it comes out. Finally, pull tight and clip the thread, the tails will be left buried in the foam. 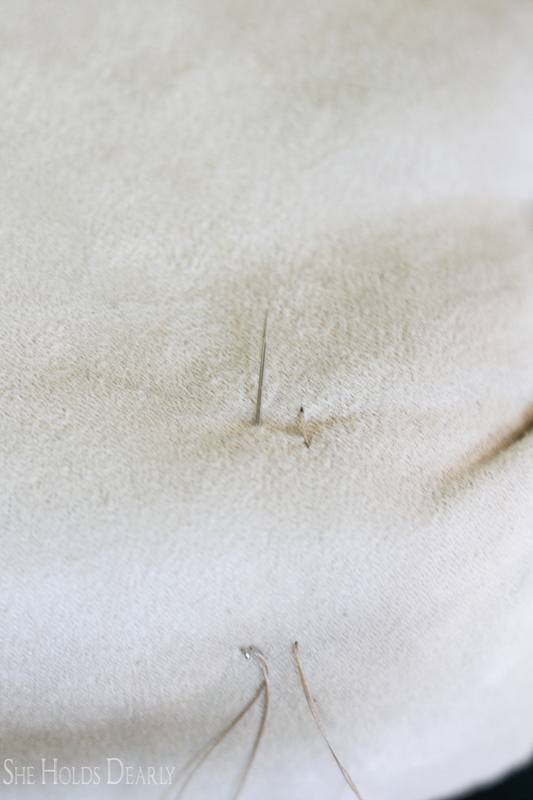 Keep re-measuring and adjusting the pins a little on both sides before you start a new tuft. One you are finished, as always, Scotch Guard the living daylights out of that baby. 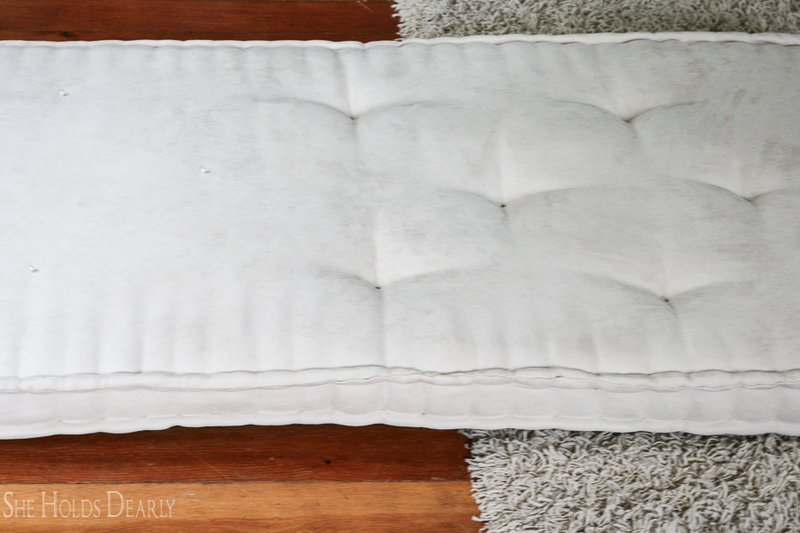 Spot clean with baby wipes or rubbing alcohol. 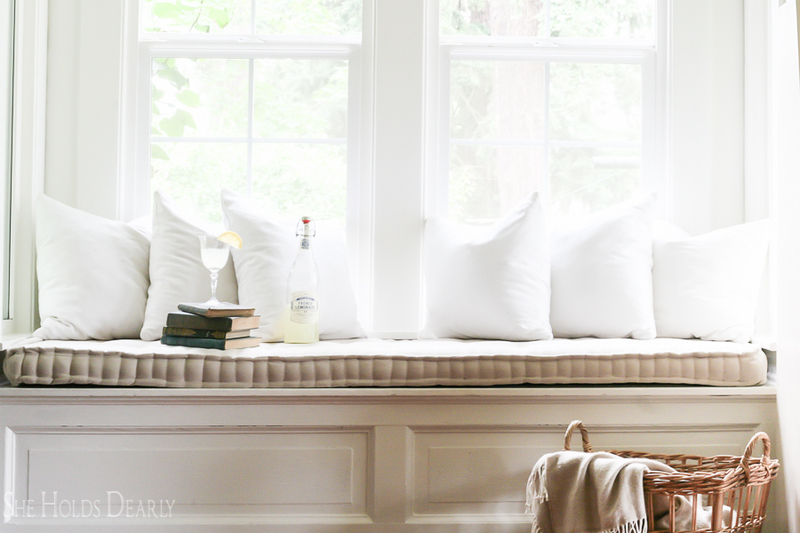 I recently wrote a post on how to Add a Zipper to a Pillow in Ten Minutes where I showed how I quickly made the six pillows on our window seat. 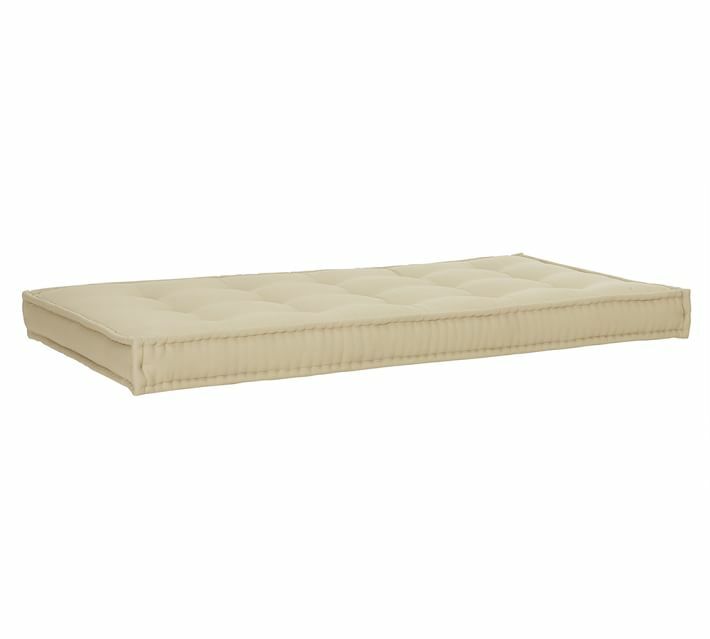 If sewing is not your thing, I have included the best french mattresses I can find online. I am very pleased with the final result. 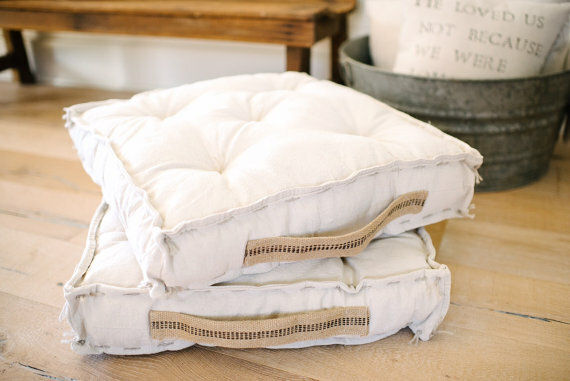 Now that I know how to make french mattress style cushions, they will be my cushion of choice in the future. Simply beautiful. You amaze me, truly. Oh my, what wonderful compliments. Thank you for your encouragement! Oh my, how absolutely lovely. And you explained it so well. 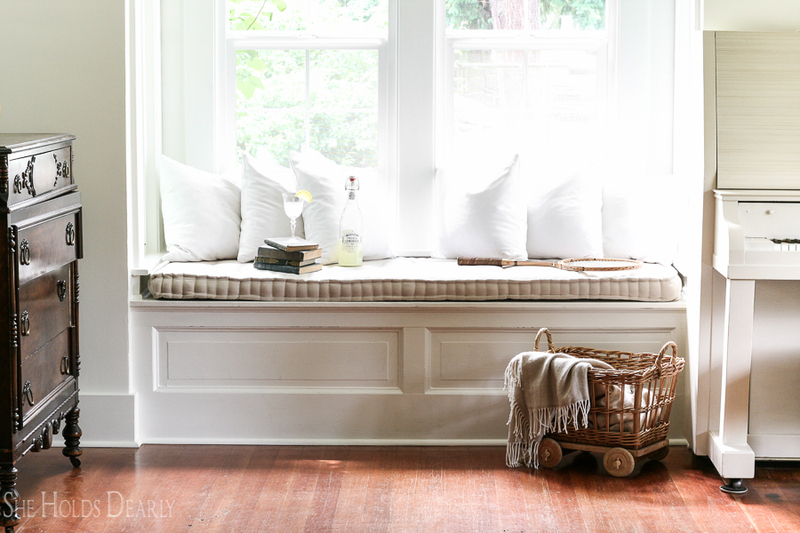 I have an old iron crib that I would love to make into a settee and this would be the perfect seat for it. Now all I need is your gifted hands and perseverance. 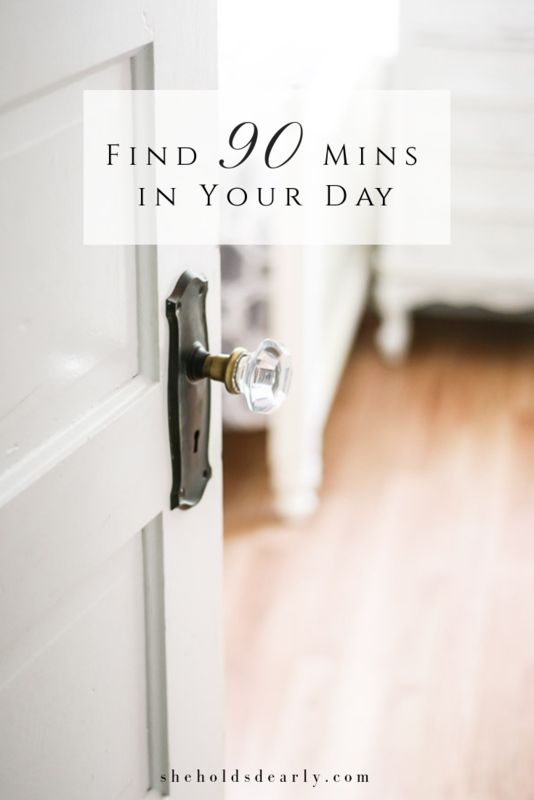 From the projects you are sharing, I can see your revamping of your living room is happening. I am so pleased that it makes sense. 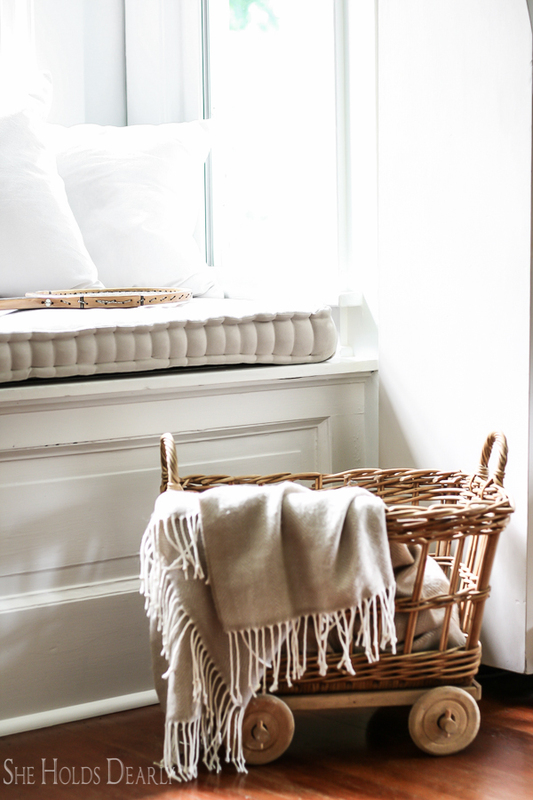 Your iron crib sounds PERFECT for a french mattress. And yes, the reveal is coming SOON, I’m so excited. 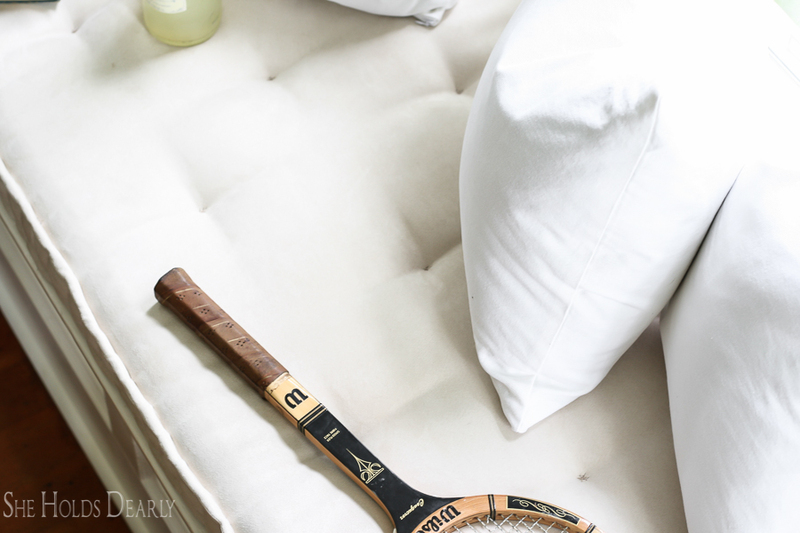 I LOVE a beautiful French mattress, and yours is certainly that. Explained and detailed so perfectly. Thanks for this great post! Great tutorial. I can definitely see myself using this. Thanks for sharing. You bet! Thanks for stopping by. Thank you, Kristine, I agree with everything you have said! Oh, I am so pleased! 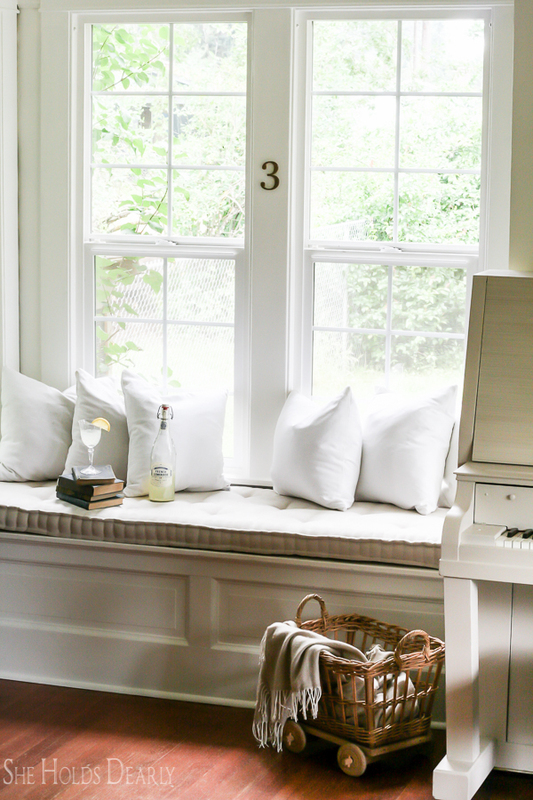 What beautiful window seat! 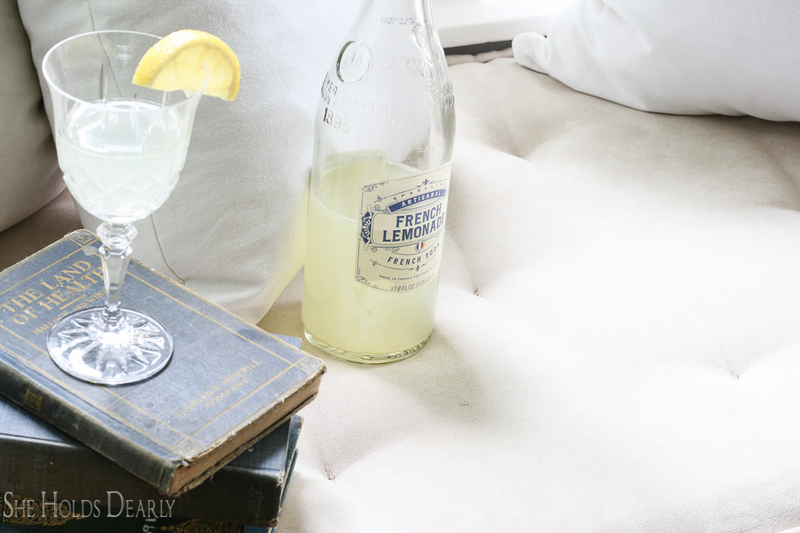 The cushion makes it look so inviting! Great idea. Have wondered about trying one of these. You give me courage. This is a great tutorial. I will have to give it a try. Sarah, you are so talented! I wish I had the even a bit of your talent when it comes to stuff like this! 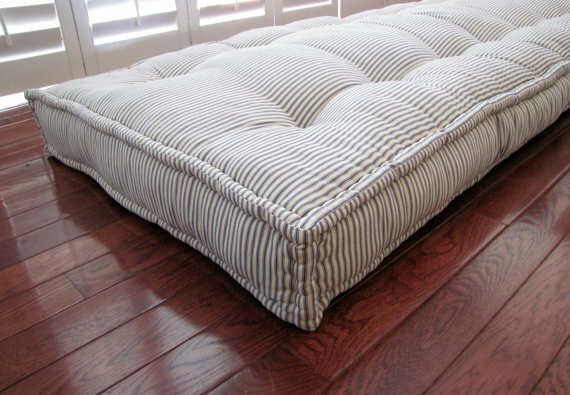 I have a bench I’ve been hoping to find a cushion like this for, but didn’t want to shell out the $ to get one. If I work up enough nerve I think I’ll try your tutorial. 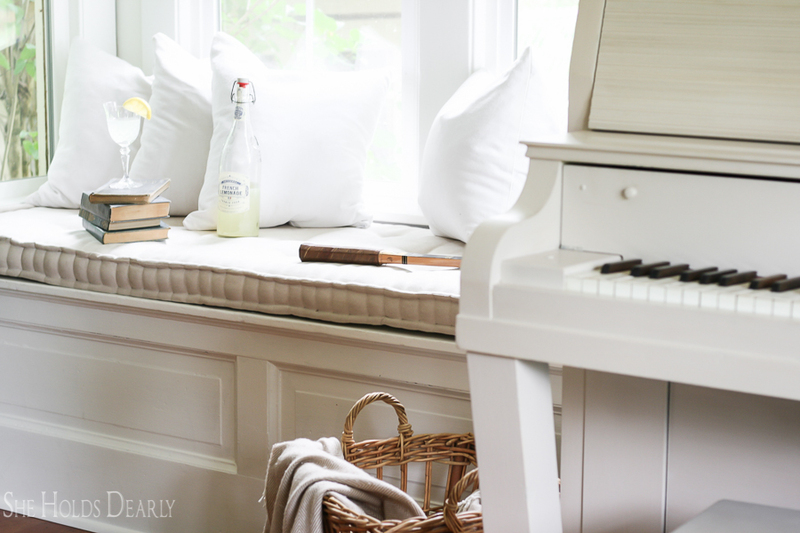 In the mean-time I’m going to feature it this week on The Creative Circle Link Party. Thanks for sharing it with us! Oh, I hope you find the perfect cushion solution very soon! Thank you for the feature, I’m so excited! I made one before, but I just love how you quilted it. It adds so much charm and feels soft and warm. You amaze me! Thank you so much, Julie, you just made my day!! This is beautiful sarah! 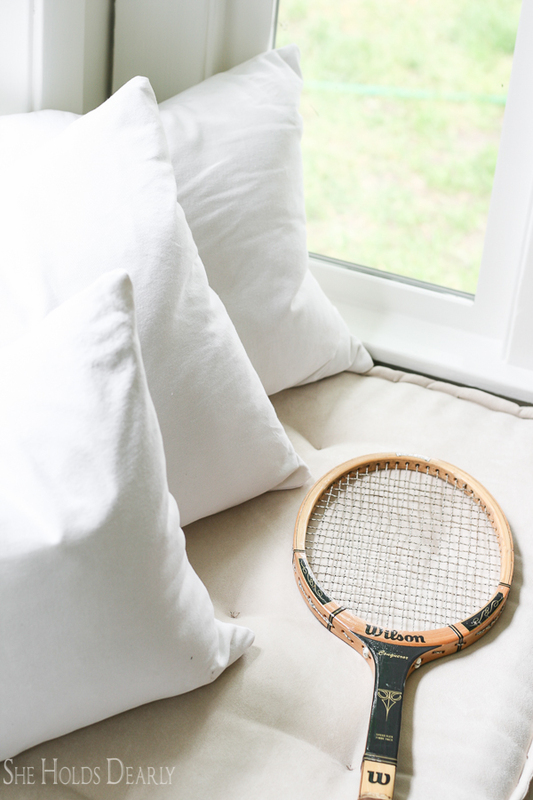 I wish I could sew…I need a new cushion on my window seat…but I just staple the frabric to a piece of wood. I wish I could have one this beautiful!! This is just amazing, Sarah!! I’ve always wanted one and you outdid yourself. It’s just perfect! Love this Sara. You did a beautiful job, your tutorial was excellently done, and your photos are stunning as usual. I’ll be pinning for inspiration later. Oh, you are so sweet, Cheryl. Thank you for your kind words! Excellent job, you should be proud. I know how to sew, but I also know my tolerance level. That would drive me nuts. Kudos to you! Thanks, girl! It was a little challenging, as in took a lot of time. But, not that complicated really. Thank you so much! 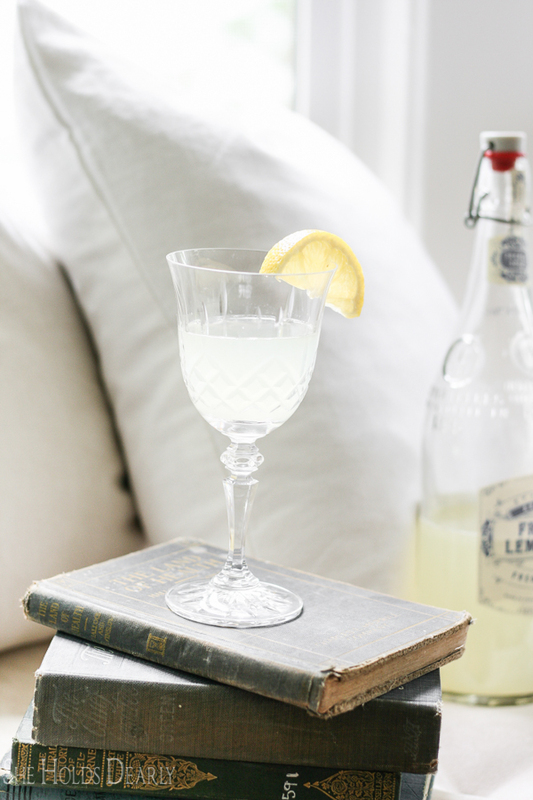 I need to make 3 of these and these instructions are great and yours turned out beautifully! If yours required 6 hours of hand tufting I’m not sure how motivated I will be for the final 2, but I’m willing to give it a shot :). Love your work! I am inspired with your creativity. I can’t wait to try this. Thanks and keep sharing. Thank you so much for providing this information. 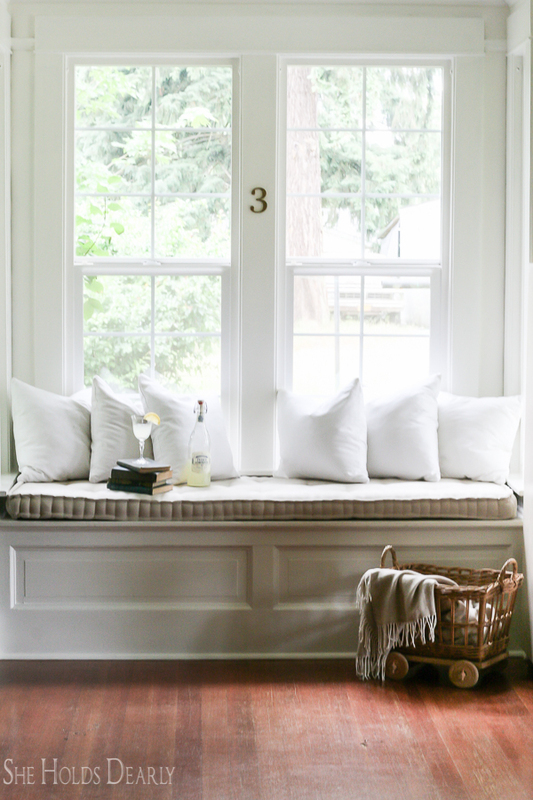 I need to make a custom size for a window seat in my new house. I will be following your tips and am excited to get started. I’m so glad I found your blog. I’m so in love with your style. 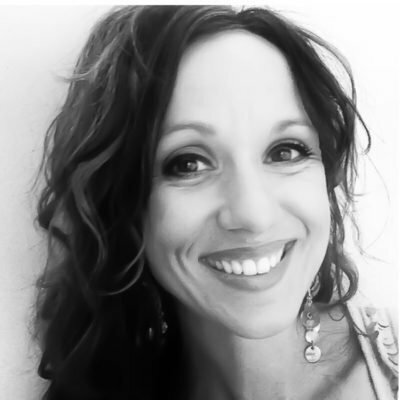 You are so welcome, Lisa, thank you for all your sweet words. 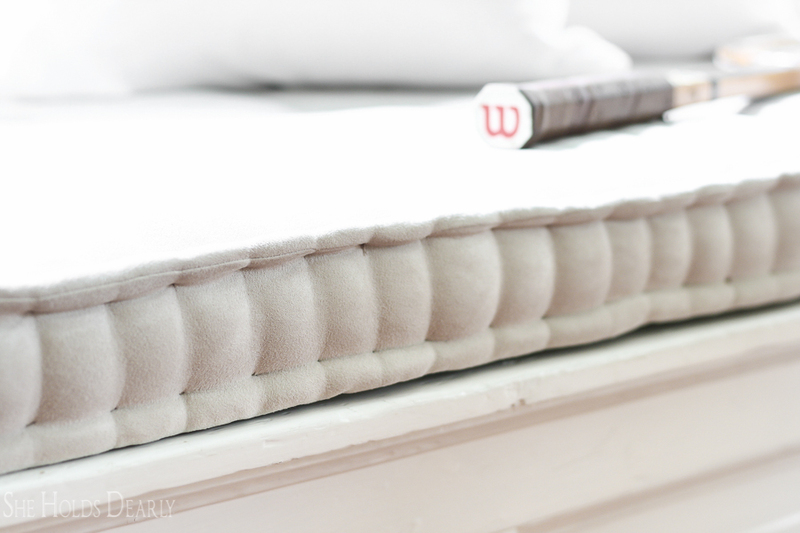 Let me know if you have any questions, I think you will really love your french mattress. Mine is a prized possession of mine! 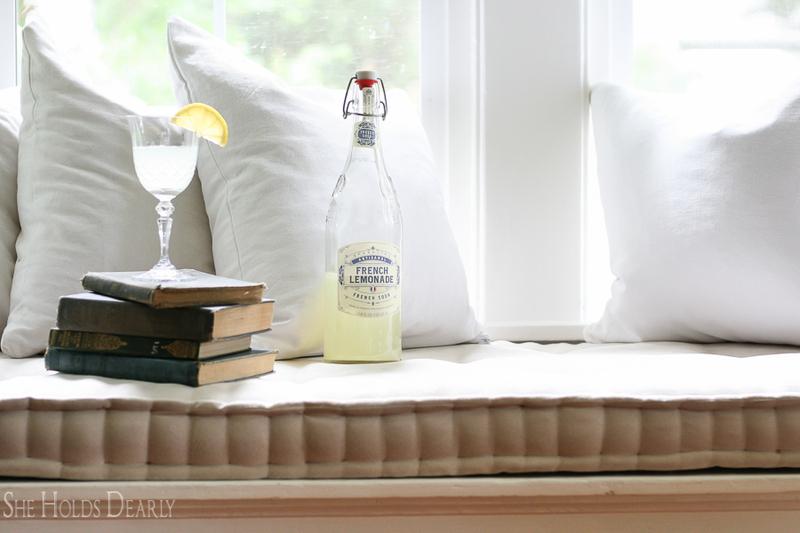 I’ve procrastinated and need to get started on my French mattress window seat cushion. Do you think drop cloth (bleached and washed several times) would be a good fabric to use for my cushion. 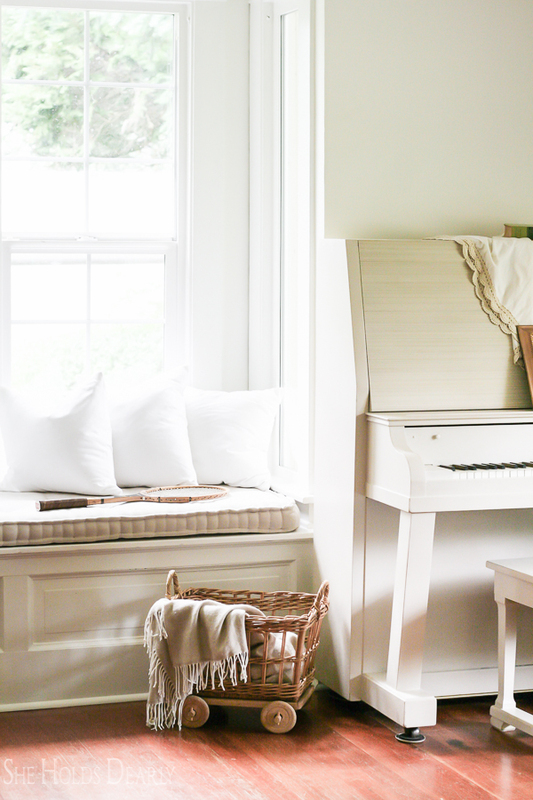 I’m wanting to match my drop cloth curtains but wanted to get your input before purchasing my items to get started. Hi. I am more of a visual learner. Lol. Any way to get a YouTube video with a link of you doing the actual stitching on the edges. Like REALLY close up? Thank you for the instructions. I moved to a lake cottage and the only 3 things worth keeping in the 2-30cubix feet dumpsters of junk was the old Chambers stove, the old deeeeep kitchen sink and an awesome wood frame from a couch. 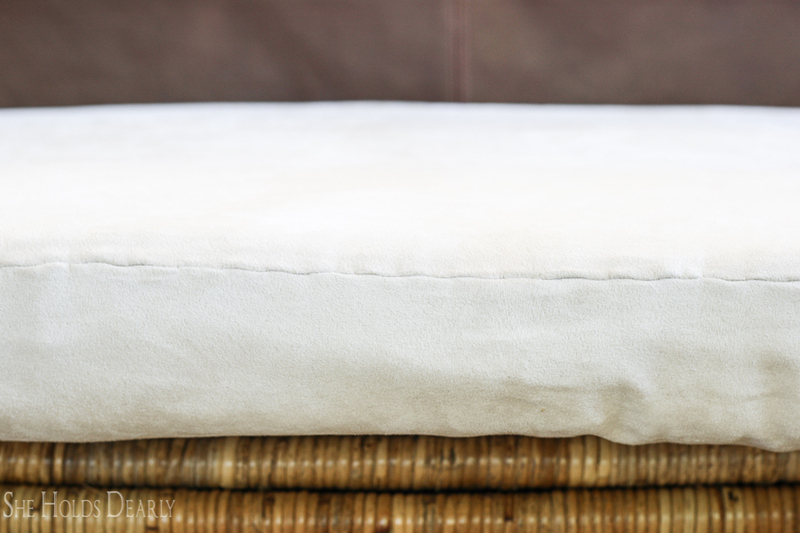 It would cost more to buy cushions than to buy a new sofa. So I am going to make a long cushion using your instructions. I will use 6 inch foam and sturdy fabric. If you have any other hints email me!! Wish me luck ya’ll!